This indigo-blue vase is a favorite of mine. 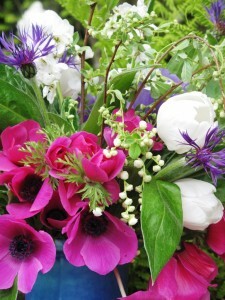 Love it with fucshia anemones, bachelor’s buttons and white tulips. Stunning detail shows those velvety black button-like centers of the anemones. Color wheel lesson: The flowers and vase combination illustrate an analogous color palette. Analogous colors are adjacent to one another on the color wheel. Fuchsia, purple and indigo are pleasing when viewed together because they each share varying quantities of the primary color blue. White floral accents offset the black centers of the anemones, adding a graphic punch to this composition. This entry was posted on Sunday, April 28th, 2013 at 6:54 am	and is filed under Creativity, floral design, Gardening, Slow Flowers: 52 Weeks, Writing. You can follow any responses to this entry through the RSS 2.0 feed. You can leave a response, or trackback from your own site. I love that arrangement Debra & the colors are some of my favorites. 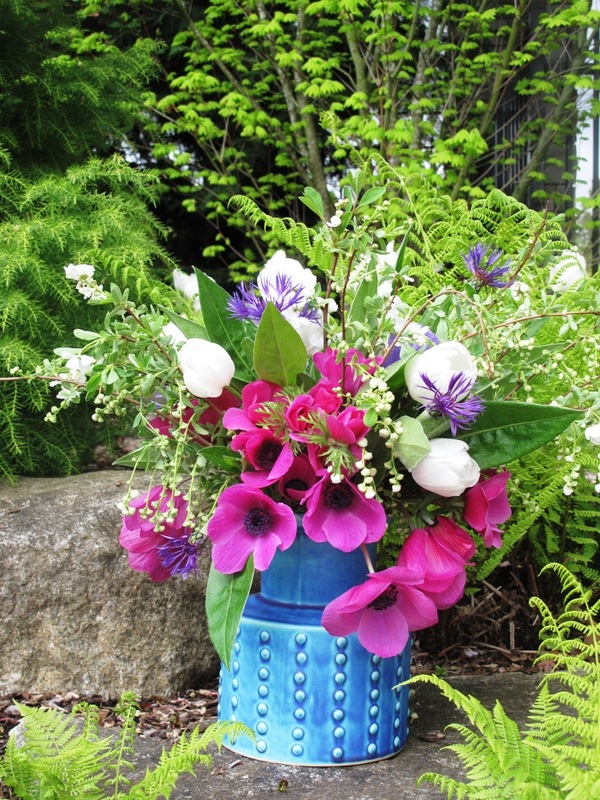 The blue vase sets it all off beautifully. It was a pleasure to meet you in Carpinteria!